In 2017, archaeologist Zhang Chi at Peking University published the article “Longshan-Erlitou Cultures: Changing Cultural Patterns in Prehistoric China and the Emergence of the Globalization in the Bronze Age” in the sixth issue of the journal Cultural Relics. After analyzing the scale and quantity of prehistoric settlements in the Yangtze, Yellow and West Liaohe river basins, Zhang theorized that the emergence of civilizations in the agro-pastoral transitional area of the crescent zone, to a large extent, subverted preceding traditional cultures, such as the Qujialing-Shijiahe Cultures (c.3400-c.2000 BCE) in the middle reaches of the Yangtze River, the Lingjiatan Culture (c.3600-c.3300 BCE) and Liangzhu Culture (c.3400–c.2250 BCE) in the lower reaches, the Hongshan Culture (c.4700-c.2900 BCE) in the West Liaohe River Basin, and the Dawenkou Culture (c.4100-c.2600 BCE) of the Haidai Region, which geographically extends to the lower valleys of the Yellow and Huai rivers, while leading to the quick rise of the Central Plains. The dramatic changes in prehistoric cultures were inseparable from the globalization that occurred in the Bronze Age. Zhang’s article has two highlights. First, it underscores the significant contributions of the flourishing crescent zone in the era of the Longshan-Erlitou Cultures (c.3000-c.1500 BCE) to the historical changes in the Chinese civilization and cultural pattern. Second, it views the issue from the broad perspective of the globalization in the Bronze Age. Nonetheless, many problems merit deeper discussions. Such crops as barley and wheat and domestic animals like sheep, goats, oxen and horses from the western Old World, namely Central and West Asia, contributed much to the transformation of prehistoric cultures from Longshan to Erlitou times. This was highlighted in another paper by Zhang titled “The Regional Features of the Subsistence Economic Structure in North China during the Early Stage after the Introduction of Crops and Domestic Animals from the Western Old World” published in the third issue of Huaxia Archaeology in 2017. With the introduction of metallurgy to the East, copper and bronze casting techniques struck root and thrived in the Central Plains, marking the arrival of globalization in the Bronze Age. However, Zhang admitted that new crops and domestic animals from the West simply supplemented subsistence agriculture in the Central Plains, generating few effects on local life. In other words, the globalization in the Bronze Age played a limited role in the rise of the Central Plains. Therefore, globalization was not the fundamental reason for the radical change in prehistoric cultures. In my opinion, it was probably the ultimate result of the rivalry between two economic models starting about 8,000 years ago: the prehistoric commodity economy in the Yangtze River Basin and the small-peasant economy in the middle reaches of the Yellow River, later the Central Plains. Ultimately, the middle reaches of the Yellow River, the economic foundation and superstructure of which was in harmony and suited to the living environment of East Asia, abandoned the commodity economy of the Yangtze River and revolutionized prehistoric cultures. The lower reaches of the Yangtze River started to develop in the Majiabang Culture period (c.5000-c.3300 BCE) and boomed during the Songze Culture period (c.3800-c.3300 BCE), displaying the salient features of a market-based commodity economy. The peak arrived in the Liangzhu Culture period, bringing about the Liangzhu commercial state or commodity economic civilization. Prosperity in the middle reaches of the Yangtze River began in the Daxi Culture period (c.5000-c.3300 BCE) and continued from the Qujialing (c.3400-c.2600 BCE) to the Shijiahe Culture (c.2500-c.2000 BCE). The region was likewise based on commodity economy. As a result, great wealth was accumulated in the two cultural centers in the middle and lower reaches of the Yangtze River. 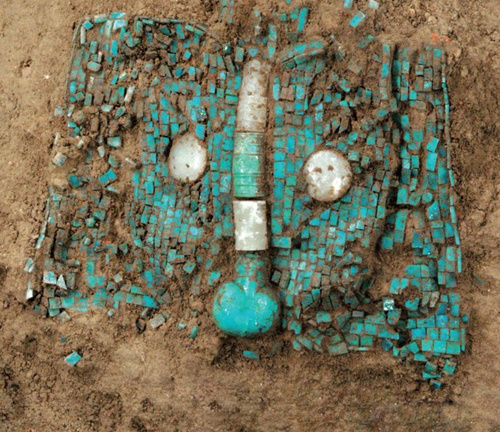 Recent excavations of graves and settlements of the Dawenkou Culture in the Jiaojia site in Jinan, Shandong Province revealed signs of a commodity economy and a “middle class” of merchants. Generally, prior to the Longshan Culture period, culturally advanced areas in prehistoric China all featured a commodity economy. However, the commodity economy failed to gain predominance in contemporary Central Plains in the middle reaches of the Yellow River, though society became increasingly complex during the Miaodigou Culture period (c.3000-c.2000 BCE). Hence there was a protracted battle between the commodity and small-peasant economy in prehistoric China. Before the Longshan era, the Yangtze River Basin, Haidai Region and West Liaohe River Basin were culturally stronger than the middle reaches of the Yellow River. In the Longshan era, the crescent zone and regime emerged not only because the oasis agriculture in the Hexi Corridor and Xinjiang was closely linked with the agricultural economy of Central Asia, but more importantly, the thriving of Eurasian grassland nomadic culture guaranteed the demand and supply side of animal husbandry in the commodity economy of the crescent zone. On the contrary, traditional small-peasant economic zones like western Henan and southern Shanxi provinces, even including the Guanzhong Area, constituted the supply and demand side of stable agriculture. To put it more plainly, the rise of the crescent zone was brought about by “middlemen” in border trade of agriculture and animal husbandry. In archaeology, it could manifest in the “jade currency” system implemented among the Shimao (c.2200-c.2040 BCE), Qijia (c.2200-c.1600 BCE), and Taosi (c.2300-c.1900 BCE) cultures. Sheep, oxen, metallurgy and millet were also shared among the three cultures. However, the firstly developed Shimao Culture was the first to go downhill, due both to the fragile ecosystem and to the final rise of the Erlitou Culture. The ideology of encouraging agriculture instead of trade was eventually entrenched, blocking the supply side of agricultural commodities for border trade in the crescent zone and shattering the trade network of middlemen, shaking the central position of the crescent zone. On the Chengdu Plain at the lower end of the crescent zone, a new cultural center emerged, where the use of jadeware specific to the Shimao Culture was inherited. Interestingly, gold artifacts of the Lower Xiajiadian Culture (c.2200-c.1600 BCE) from the Inner Mongolia Autonomous Region and from the Chengdu Plain held an important status in local social life. The two surviving centers in the crescent zone had close relations with the nomadic culture on the Eurasian grassland, which favored gold, yet they were distant from the secular culture of Erlitou, Erligang and Yinxu in the Central Plains. To my understanding, amid the globalization in the Bronze Age, East Asia, largely the Central Plains, embraced copperware manufacturing techniques alongside wheat, ox and sheep, while millet was introduced to the West. During the process, the crescent zone played a major role as a channel for exchange. These techniques indeed drove East Asia, particularly the Central Plains, to grow into a cultural center distinct from the West. With the shaping of the East Asian civilization in the Xia, Shang and Zhou dynasties (2205-771 BCE), the waning crescent zone was reduced from a medium of trade in Eurasia into a protective film attached to the Central Plains or the central region of East Asia and facing the vast Eurasian grassland. Like a cell wall with valves, it obstructed the free exchange between the West and the East. Archaeological materials show that many advanced political practices and strategies in the Xia, Shang and Zhou dynasties were regarded as state secrets and prohibited from spreading to the West, such as the developed astronomy and calendar knowledge system, the complete gnomon measuring technique, the classical Chinese world outlook, and the system of rites and music. By contrast, lots of political inventions and technologies in the Central Plains were made available to the Korean Peninsula and Southeast Asia, exerting far-reaching influences on them. For example, the teeth-shaped jadeware of the Erlitou Culture spread to Vietnam. Obviously, pre-Qin regimes in the Central Plains deemed the lowland of East Asia as their inside, and the highland of the Eurasian grassland as the outside. The closeness to the East and distance from the West deepened the divergence between the two parts of the world in the Bronze Age, consolidating the core position of pre-Qin Central Plains in the East Asian civilization. He Nu is a research fellow at the Institute of Archaeology at the Chinese Academy of Social Sciences.